Don’t You Try To Stop Me! Hello bunnies! Can you believe we’re almost to April already? I know, time really flew by this month. At least, it seems like it did for me. Have you been out to N21 yet?? That is where my super cute Hydrangea dress by Moon Amore is from! I think it could also be used as a nightie, because there are sheer versions as well. And if you haven’t been to Shoetopia yet…what are you waiting for?? Fri.day is there with the Sadie platforms and I love them so much! You can wear them with or without the socks, which makes them just perfect in my book. I hope the month has been great for all of you! Hello bunnies! Do you ever just get an idea for a photo that you can’t get out of your mind? So you try and try to recreate it but Second Life being what it is, you can’t quite get it right? But what you come up with makes you happy anyway? That’s my photo for today. If you haven’t been out to The Epiphany yet, you really need to go! Blueberry‘s Angelberry set is incredible! I am wearing the rare wings in Pure from the set and they are magnificent. My dress is also from The Epiphany. It is called Agape and is by Violent Seduction. I think it’s so so pretty! Everyone’s favorite creepy event, Memento Mori, is also going on right now! The Christine hair by Doe is one that you can pick up at the event, and ugh, it’s so beautiful. I feel like this photo just doesn’t do it justice. My background today is also from Memento Mori. It is the Dreary Sky Bubble from Drot, and it is PERFECT for a dark party, or if you want to build a cemetery or something! My Land, Isn’t It Grand! Hi bunnies! When I was younger, one of my favorite stories was Charlotte’s Web. Oh gosh, I LOVED that story so much! When I was putting together a look today, the moment I saw this outfit, naturally all my Charlotte’s Web love came rushing back! The Epiphany starts on Sunday!! I absolutely fell in love with the The Winter Gacha set from Zenith! The outfit I’m wearing includes the piggy and balloon, so you’ll have to alpha out your arms and hands for it to work properly. But loooooook at it!! Just too adorable for words! Plus I’m wearing the Leather Bow platforms and socks from the set, and the headband with earmuffs that is Zenith!‘s Epiphany exclusive item. Remember that you can only buy the exclusive items with Epiphany points, so be sure if you have extra items that you don’t want to trade away, you can redeem them for points! I’m also wearing the Mashell skin from Insol that you can get at The Epiphany. This is for Catwa heads only, so keep that in mind if you play for it. It’s just so cute! I hope you all are ready for The Epiphany, because whew! It’s going to be a great one! Hey bunnies! So I’m not sure if you’ve heard, but there is a new subscription box coming up! Powder Pack is an awesome new box that is filled with 12 new makeup appliers for Catwa heads! Check out who is going to be in the first round! 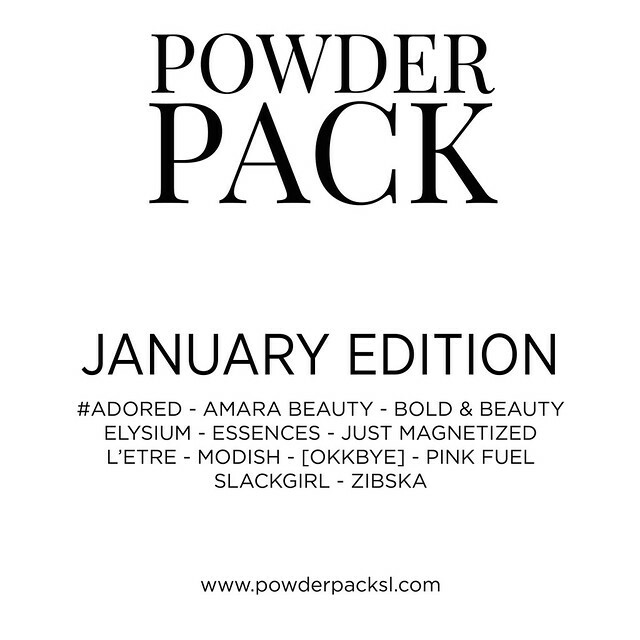 I am beyond excited for this, and really honored to have been chosen as one of the Powder Pack bloggers. So you KNOW I will have an unboxing video coming up when the box is sent out! How do you get the box? It’s super simple. You head on over to reserve your box here! OR you can get in on it through marketplace, which I think is awesome if you’re like me and don’t like going anywhere or simply don’t have time to log in before the box comes out. After that, you just wait until the 17th when your box is automatically delivered to you. Yep, that’s it! You don’t have to join an in-world group and give up a space or anything. So easy! After you get your box, be sure to take pics and add to the Powder Pack Flickr group for a chance at being named Powder Pack Princess! If you’re named Princess, you get THREE free months of the Pack, plus your photo will be featured on the website. Woo! Check out the Powder Pack website for more information and stay tuned for my first Powder Pack unboxing video! Hello, ice bunnies! One thing I love about winter are cute cute coats! They just make me want to go play in the snow or go ice skating! Neve is going to be at The Liaison Collaborative with the Snow coats. Oh I am just in love with this! So pretty and feminine, it makes me feel like a beautiful Victorian doll. The Chapter Four is open, and that is where you can get the sweet Solana hair by Wasabi Pills. It comes with both regular and windblown options. I’m wearing the windblown one in this photo. Hello bunnies! I hope you are all having a great week so far! I feel like I seriously need to work out this week. All the eating from Thanksgiving and all the Netflix binge watching I’ve been doing has made me feel like a total sloth! If you haven’t been out to N21 yet, you definitely need to goooo! That is where I got these awesome Open sweat pants by Sabotage, and the Retro bra by Pseudo! If I had exercise clothes this cute in RL, I might just work out a little more often! Hiya bunnies! So I’m not sure if a lot of you who have been reading my blog for a while would remember this, but Aldwyn first appeared in my blog more than a year before we got together. It’s not a great photo, and we’re both… well, look, man. It was 2009. It was a different time. The world was different. It’s not our fault. We didn’t know any better! But in that photo, we were using a laundry set. And now I have a new laundry set! So, time for a new laundry photo! Second Spaces has the Laundry Day set for The Arcade! And it’s fabulous! There are 16 items to collect, 14 commons and 2 rares. [The washer/dryer and the sink are rares. And the washer/dryer do not have the clothing textures on the insides. I added those.] Each item is only 1 land impact, so the whole set is 16 LI! Craziness! In the old laundry set Aldwyn and I used in 2009, it was 109 prims for a small set. Mesh is awesome, you know? Hey bunnies! I’m back at it again with the videos! *laughs* Today I’m just kind of talking a bit about how I use the AnyPose in SL to make couples poses. And I’m rambling. That’s gonna be my thing, I guess. But I did the pose and then I took a picture, so I knocked out two birds with one stone today! Well…two stones, I guess. But… Oh whatever, here’s the video and picture! I am just loving all the things from Whimsical! My outfit today comes from the Hell Bound set by Storybook. This tiny dress is only fit for Maitreya bodies, so keep that in mind when you play for it. I am also wearing wings that you can get with the set, but not the tail or horns. I thought that the Arwen hair and skull by Truth that is at The Secret Affair went with this outfit and the feel of my photo very well, so I just had to wear it. Hi there, bunnies! Every time I’ve gone to a dance, I always end up barefoot at the end of the night. Are you like that? There’s really only so much dancing someone can do in heels, I guess! Uber is starting on the 25th!! I am wearing the Strappy dress by Zenith that will be at Uber. It’s so darling! I just love the little tasseled belt, and the fact that it doesn’t just hang straight down. I love clothes that have a little bit of “movement” to them! Olive is also at Uber with the Stardust hair. It’s a simple style, but that is often my favorite kind of style because you don’t really need an occasion to wear it.